Here it is! The final cover for All Things Rise, due out in May 2015 by Bold Strokes Books. I think the most anxiety-producing element of constructing a book, aside from finishing the manuscript of course, is the cover. How do you create a single image that encapsulates an entire 300-page narrative? And what if the designer doesn’t have the same vision you have for the book jacket? These thoughts probably go through every writer’s head as the production of the physical book gets underway. In my case, I had no idea what I wanted the cover of my first novel with Bold Strokes Books, All Things Rise, to look like. I’m also not the greatest at selecting fonts. But what I did have was a very clear image for the main character of the book, Cole. I started with a sketch and then fleshed out the character portrait in black and white. The tones were all added using brush tools in Photoshop. I love this cover image. I’m crazy about it. I keep it on my phone so I can show it to my friends, whether they want to see it or not (smile). Thank you, Sheri and Radclyffe! May 2015 can’t come soon enough! Knowing just a wee bit about your book, I love the art work! Cole is perfect, and the combination of old and new worlds makes a striking cover. Really looking forward to reading your book! Congratulations! Thanks, Sarah! Can’t wait for you to read it! Can’t want for your first novel. It’s sounds really interesting. Your drawing of Cole is awesome & I’m a big fan of your Jane’s World comics. Thanks, Cindy!! Really appreciate it. 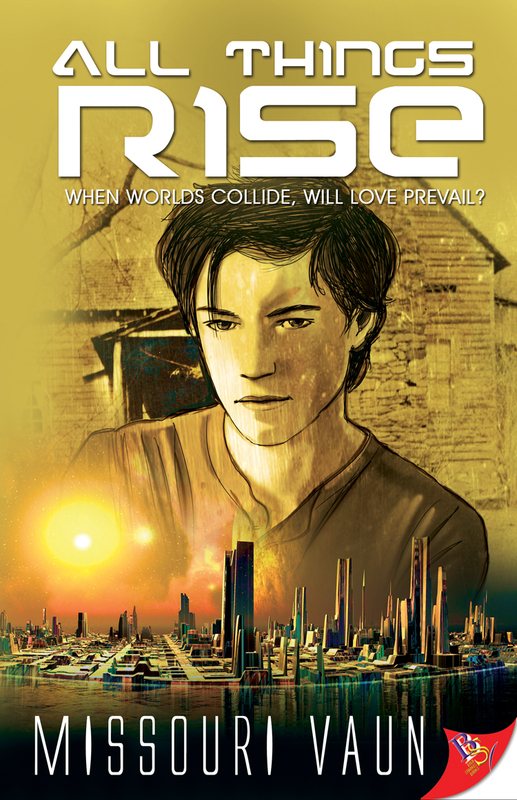 Can’t wait for you to read All Things Rise! And just in case you’re interested in keeping up with the latest Jane’s World news you can follow along on Facebook (Jane’s World), Twitter (@PB9Comics), Tumblr (PB9 Comics), and Instagram (@PB9Comics). Here’s my website with more info: http://pb9.com. Thanks!